Here's the trailer for July's big "Independence Update," showcasing some brand new Bros, and a couple fresh techniques for spreading freedom. 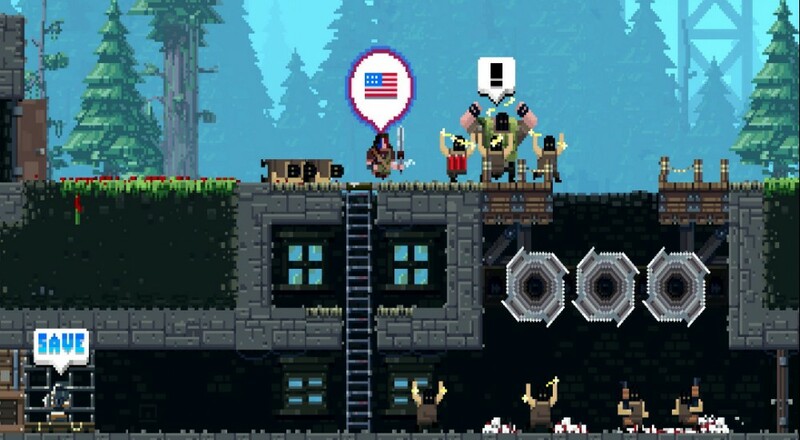 BROFORCE (all caps, please) gets me so pumped I wanna fry up a few hotdogs in a blazing canister of C-4. While Brocketeer heralds from the Golden Age of Bros to powerbomb capitalism into terrorists, Scottish-American Broheart hacks freedom into the now gaping chest cavities of the unpatriotic. And of course, celebrate July properly with teeth-obliterating new melee attacks! Your Bros can now drive chainsaws straight into the faces of your enemy, or shatter skulls with the most lethal of American arts, the Roundhouse. But of course, what new feature have Bros everywhere been calling for? Feast your eyes on the Bro-ffet, as all Bros on the screen rip open their shirts and flex those huge guns, for America.